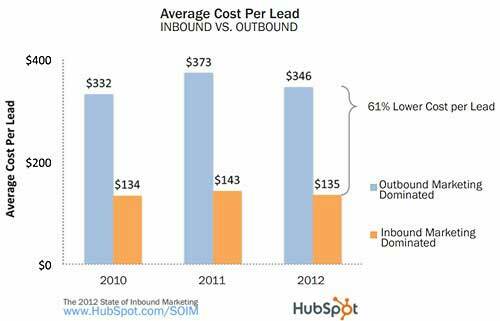 Businesses that use primarily inbound marketing strategies for lead acquisition consistently report lower cost-per-lead (CPL) rates than those using outbound-centric strategies, according to the 2012 State of Inbound Marketing report by HubSpot. Among companies with outbound marketing-dominated strategies—those that spend more than 50% of their lead-generation budgets on outbound marketing channels—the average CPL was $346 as of January 2012. By contrast, among inbound-centric companies (those spending over 50% of their lead-generation budget on inbound marketing) the average CPL was $135—61% less than the CPL of outbound-dominated businesses. Moreover, the findings are remarkably consistent with previous years: In studies conducted by HubSpot in 2010 and 2011, inbound marketing-centric organizations registered 60% and 62% lower CPL, respectively.